The clade Dinosauria was originally defined by Sir Richard Owen in 1842, in a two hour speech that reportedly held the audience captivated. The original dinosaurs of this new group were Megalosaurus, Iguanodon and Hylaeosaurus. However, each of these animals was known only from fragmentary specimens. It wasn't until the discoveries of dinosaurs in North America in the mid-19th century that people began to get a clearer picture of what dinosaurs looked like. It is generally accepted that the first discovery of dinosaur remains in North America was made in 1854 by Ferdinand Vandiveer Hayden during his exploration of the upper Missouri River. 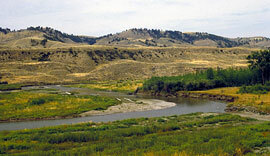 Near the confluence of the Judith and Missouri Rivers (shown above) Hayden's party recovered a small collection of isolated teeth which were later described by the Philadelphia paleontologist Joseph Leidy in 1856, in the Proceedings of the Academy of Natural Sciences of Philadelphia. A short two years later, Leidy had the honor of describing the first reasonably complete dinosaur skeleton the world would know, Hadrosaurus foulkii. Named after its discoverer William Parker Foulke, this specimen was recovered during quarrying of a sand pit in Haddonfield, New Jersey. The real significance of this specimen was in its limb proportions. For the first time scientists studying these animals could see that some dinosaurs were bipedal, walking on two legs instead of on all fours. Bipedalism was a revolutionary thought for a reptilian posture. This specimen, now on display at the Academy of Natural Sciences of Philadelphia, was originally mounted in a free-standing bipedal pose by Benjamin Waterhouse Hawkins in 1868. The records for attendance at the Academy show that visitation increased three-fold with this new exhibit, testimony to the public's long-standing and intense fascination with dinosaurs. For many years, Hadrosaurus foulkii was the only dinosaur on public display. 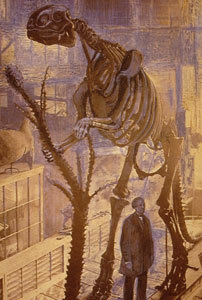 Duplicate casts of the skeleton were made for other institutions both in the United States and in Europe. Dinosaur skeletons were found for the first time in abundance in the Garden Park area of Colorado and at Como Bluff, Wyoming, in the late 1870s. These specimens initiated the First Great Dinosaur Rush in North America, driven largely by the efforts of a Philadelphia paleontologist, Edward Drinker Cope (on the left), and Othniel Marsh (on the right), a paleontologist from Yale University. These two men started as friends but became bitter rivals in a feud of legendary proportions. The stories surrounding these two include tales of armed field parties, spies, and intercepting shipments of fossils intended for the other. Many of these stories have been exaggerated with time but they clearly point out the bitterness of this rivalry. As a result of the tremendous collecting efforts of these two paleontologists, the public became aware of the fascinating world of the Late Jurassic, and was presented the opportunity to know the largest of all dinosaurs, the sauropods. 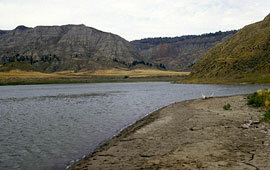 The Second Great Dinosaur Rush took place in the badlands of the Red Deer River in southern Alberta. Dinosaur remains had been known from this region as early as 1884 but it wasn't until 1910 that this region became an active collecting area. It was here that the second great collecting rivalry took place between Barnum Brown of the American Museum of Natural History in New York and C.H. Sternberg of the Geological Survey of Canada. However, unlike the rivalry between Cope and Marsh, this rivalry resembled more of a friendly competition. Also unlike the earlier efforts, the result of this collecting provided insights into the world of the Late Cretaceous.